I think I’ve finally got all my ducks in a row. Or, fish, actually. Last month when I was in Sevilla for a few days, I encountered tapas of a fish called melva. I found melva in the fish market there too, but I’ve never seen it in my local market. Melva somewhat resembles bonito, a fresh fish that I buy frequently. But, is that the same as bonito del norte, the canned fish that I buy regularly for “tuna salad”? I pulled out my fishy reference books—Alan Davidson’s The Tio Pepe Guide to the Seafood of Spain and Portugal (Santana Books); Seafood, A Connoisseur’s Guide and Cookbook, by Alan Davidson with sensational watercolors of fish by Charlotte Knox (Mitchell Beazley), and Manual del Pescado by José Carlos Capel (R&B Ediciones). The Alan Davidson books are really helpful because they give fish names in several languages, including regional variations in nomenclature. Melva is Auxis rochei, the frigate mackerel (although not actually a mackerel). According to Davidson, it is abundant in the Bay of Cádiz—which explains why it’s so ubiquitous in Sevilla. Bonito is Sarda sarda (note—not tuna), known in English as bonito or Atlantic bonito. 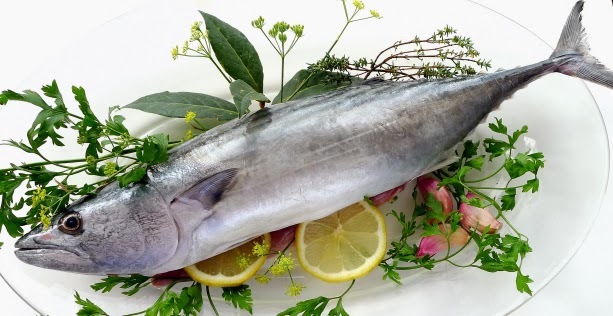 In Japan, bonito is an important ingredient in the cuisine. In Spain, this is an excellent blue fish, very meaty, fairly economical. Bonito del norte is Thunnus alalunga, albacore tuna or long-finned tuna. In Spain, it’s known as atún blanco, white tuna (to differentiate it from “red tuna,” blue-finned tuna). In summer, albacore is fished off the northern Cantabrian coast. Much of it goes to the canning industry, but, fresh, it is used in the wonderful Basque dish, marmitako, tuna with potatoes. As I’ve said before: Love the fish you’re with! I’ve got me a pretty bonito (no, I did not find out why bonito—which means “pretty”—is called bonito). Note the dark longitudinal stripes. 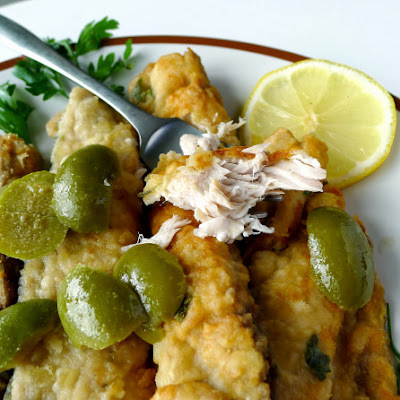 While flipping through the pages of Capel’s fish manual, I came across a fine recipe for bonito, calling for olives. As you may remember from last week, I’m on an olive roll, so this suited me just fine. 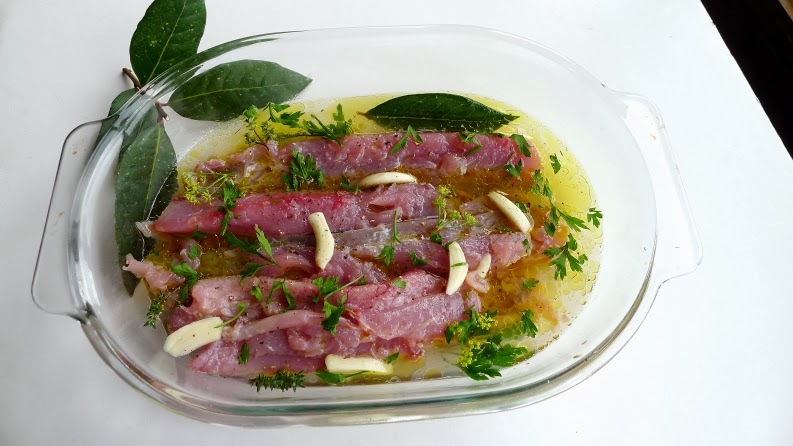 Bonito and its “blue” relatives, such as mackerel, sardines and tuna, are often prepared in escabeche, a vinegar marinade for cooked fish. This recipe is reversed—more like an adobo, as it is marinated—but only briefly—before cooking. The marinade is reduced to make the sauce. 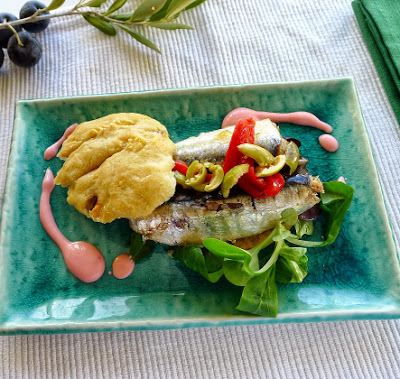 (This recipe is adapted from one published in Manual del Pescado, by José Carlos Capel and attributed to La Cocina Andaluza by Miguel Salcedo Hierro). Fillets of bonito with olive sauce. Serves 4 as a starter or 2 as a main dish. Place the fillets in a single layer in a non-reactive bowl (glass or earthenware). Sprinkle with salt and pepper. Add the oil, wine, vinegar, garlic, bay leaf, parsley, thyme and fennel, if using. Cover and refrigerate for 1 to 2 hours. Remove the fillets from the marinade. Place the marinade in a small saucepan with the water. Bring to a boil, then simmer until reduced by half, about 10 minutes. Strain the liquid and discard the garlic and herbs. Return the liquid to the pan and add the olives. Simmer gently. Dredge the bonito fillets in flour and fry in hot oil until golden on both sides. Serve hot or cold with the olive sauce. Crispy on the outside, moist fish on the inside. Olives are a piquant sauce. ¡PRACTICA EL ACEITUNING! Before you say “Gesundheit!” to “aceituning,” let me remind you that the Spanish word for “olive” is aceituna. Olivo, a word that comes from the Romans, is an olive tree, but aceituna, from the Arabic, is the fruit of that tree. I’m practicing aceituning in my own way. I just put my hand-picked olives into salmuera, a brine seasoned with garlic, thyme and fennel. They should be ready to eat in a couple of weeks. I’m also using store-bought olives in some new ways. The most familiar Spanish table olives are Manzanilla, sometimes marketed as “Seville” olives. Manzanilla is the name of the variety of olive tree. It produces a plump, meaty olive. 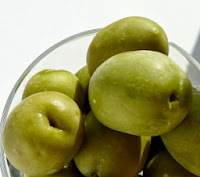 Manzanillas make up the bulk of Spain’s table olive production, but the fat Gordal olive (also called “queen”) is another favorite commercial table olive. The olives are hand-picked when still green. The curing process entails first soaking in an alkaline solution to remove the bitterness. 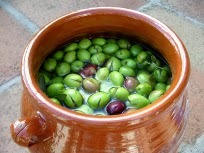 Then the olives are left in a brine to ferment, which converts the olives’ natural sugars into lactic acid. This is what gives them that wonderful tangy flavor. They are canned or bottled whole and unpitted, pitted and stuffed. Black olives are picked green. Most olive varieties, when fully ripe, turn a purplish color, not black. 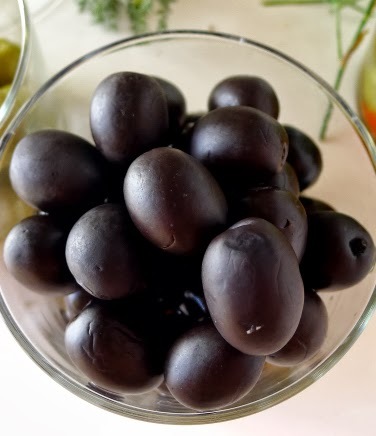 Black olives that you buy in a can—gorgeous for garnishing salads and cold dishes—are not really ripe olives. They are picked green, processed in alkaline solution, then the black color is fixed by oxidation. These are by no means the only olives in Spain. Every olive-producing region has its particular varieties and methods of curing and flavoring olives. 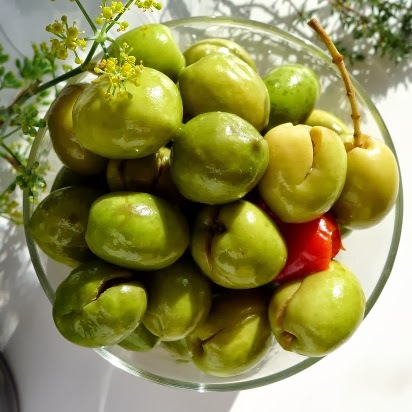 In Andalusia, you might sample aceitunas partidas, green olives (Manzanilla, Hojiblanca or Morisco) that have been cracked to split them open, then brine-cured (no alkaline is used). They may be flavored with thyme, fennel, cloves of garlic, slices of lemon, oregano and strips of red pepper. In Extremadura and La Mancha, ripe Cornicabra and Cacereña olives are prepared rayado, incised with a sharp blade, then cured in brine and flavored with local herbs. Arbequina is the varietal best-known in Catalonia, especially Lérida. These are tiny olives with a delicate flavor, simply brine-cured. The Empeltre olives of Aragón and Navarre are cured in brine when they reach a purplish-black degree of ripeness. 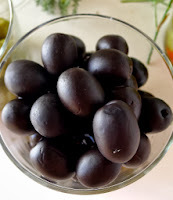 In Murcia and Alicante, the Cuquillo olive is cured when nearly black. You can add flavor to bottled, store-bought olives by draining them, then marinating for two days in salt water with slivered garlic, fresh or dried thyme, sliced lemon and a splash of extra virgin olive oil. Or, practice some extreme aceituning and get a little adventuresome. 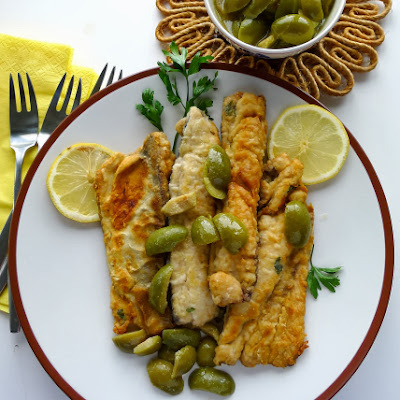 Olive Bread with Sardines. Inspiration for this recipe comes from a recipe booklet published by the board of the Denominación de Origen Protegida Aloreña de Málaga. The Aloreña olive is a type of brine-cured Manzanilla. The recipe calls for a sort of focaccia bread made with Aloreña olives and roasted red pepper, topped with grilled sardines, olive “air,” and a smear of strawberry alioli. The bread recipe didn’t work so well for me and the “air” required techniques and ingredients with which I am not familiar. So I topped the bread with canned sardines and stacked some sliced Aloreña olives on top. The strawberry alioli (garlic mayonnaise) was, uh, interesting. 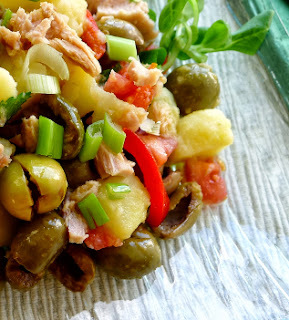 Potato-Olive Salad. I “aceituned” a typical Spanish potato salad, papas aliñadas, by upping the proportion of olives. For 1 cup of diced, cooked potatoes, I used 1 cup of pitted brine-cured olives. (Split olives are easily pitted by pressing them on a board to squeeze out the pits.) Other ingredients are diced tomato, parsley, green onions, chunks of tuna, hard-cooked egg, olive oil and Sherry vinegar. Olive-Cream Cheese Dip. This is incredibly easy! 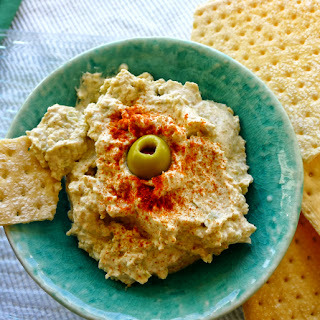 In a blender or mini processor, blend 1 cup softened cream cheese, 2 cloves garlic, 2 tablespoons chopped onion, ½ teaspoon pimentón de la Vera (smoked paprika), and ½ teaspoon ground cumin. Add 1 cup pitted green Manzanilla olives and process until they are coarsely chopped. Serve with regañás or any crisp crackers for dipping. Black Olive, Corn and Avocado Salsa. Relish, salsa or salad? 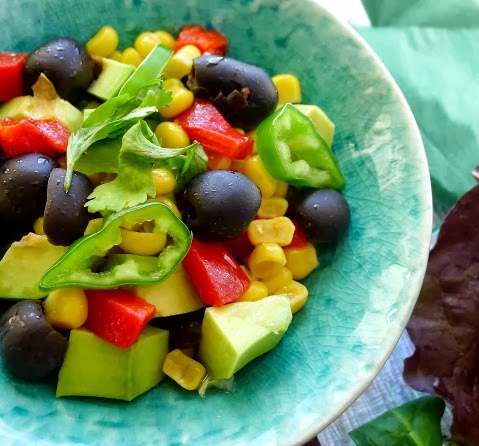 Combine equal quantities of pitted black olives, corn kernels and chopped avocado with roasted red pepper, scallions, chile to taste, olive oil, lemon juice and a garnish of cilantro. Because olives are salty, you may not need to add salt. Some of the foods from the New World, from the left, top row, pumpkin/squash, potatoes, avocado, peanuts, corn/maize; bottom row: peppers/chiles, tomatoes, beans, sunflowers, chocolate. 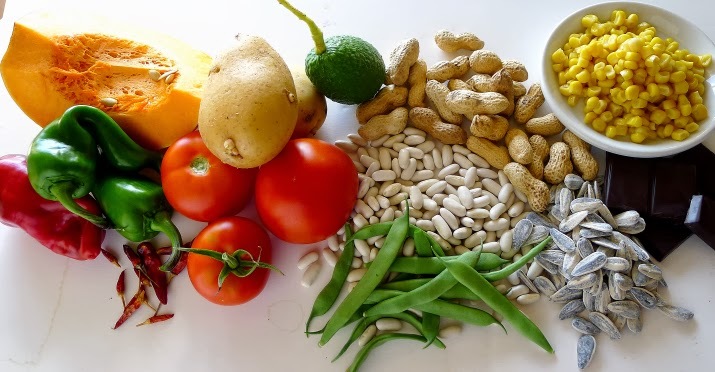 Five hundred and twenty-one years ago, when Spanish monarchs Ferdinand and Isabella sat down to dinner, there was not a potato, bean, pepper or tomato in sight. No chocolate for dessert. These and many other now-familiar foods were unknown in the world as it was known before Columbus’s voyage in 1492. October 12 is the date Columbus (Cristóbal Colón, in Spanish) arrived on the outlying islands of the American continent. In the US, Columbus Day, the holiday, falls on the second Monday of October—this year, October 14 (although the holiday is not observed in every state). In Spain, the commemoration always happens on the twelfth, but has morphed in significance over the past 80 years. Once known as “El Día de la Raza Española,” “the day of the Spanish race,” it then became “El Día de la Hispanidad,” the day of “Spanishness.” The Spaniards, after all, were the colonizers of that New World. Since 1981, the holiday has been designated Fiesta Nacional, or “national holiday.” About 13 years ago, the occasion also became “armed forces day,” an occasion for military parades before the king. (This year, crown-prince Felipe will preside, as King Juan Carlos is recovering from hip surgery.) If that weren’t enough, October 12 is also the feast day of the Virgen del Pilar, patroness of Zaragoza, the capital of Aragón. In my opinion, we should turn Columbus Day into a holiday commemorating and celebrating food, and the growing and cooking of food, as it migrated across oceans and continents following the discovery of America in 1492. The “Columbian Exchange” brought new crops, livestock and people from the New World to the Old, and from the Old to the New. It was the most significat ecological event of a millenium. On 4 November, 1492, Columbus’s party exploring the eastern end of what is now Cuba found great expanses of tilled land sown with a sort of bean (Europeans knew fava beans but not the haricot); a grain the natives called mais, “which tasted well made into flour,” and what was identified as a “gourd” called calabaza, which today we know as squash or pumpkin. 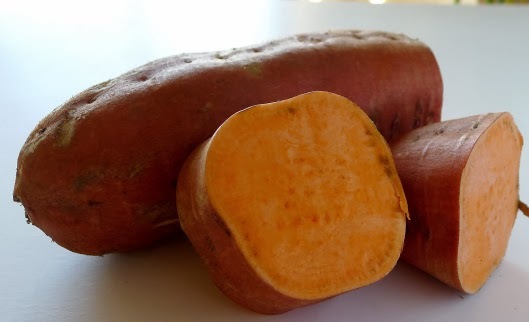 Sweet potato, from the New World. At a feast hosted by the chief of one of the islands, Columbus was served several varieties of sweet potatoes, called batatas. Columbus probably brought sweet potato plants back to Spain for they were growing here by 1493. The white potato was several years down the line, discovered around 1530 by Pizzaro’s men in Ecuador. Potatoes were cultivated by monks in Sevilla by 1539. Early chroniclers believed that Columbus had, indeed, reached the Indies, the Spice Islands in the East, where the treasured spice, pepper, came from. 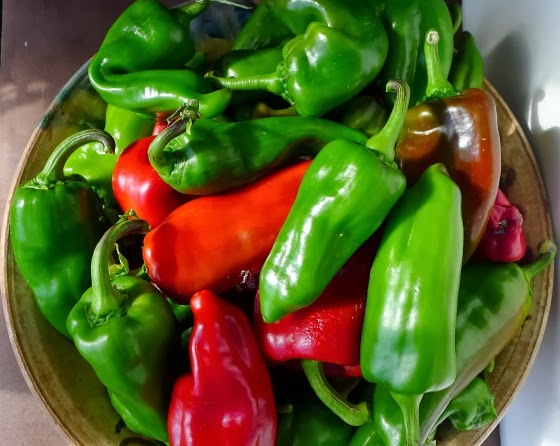 So, when served a fiery spice on his food, Columbus naturally called it “pepper” (pimienta or pimiento), which is how peppers got to be called peppers. The pepper of the New World is the capsicum, from which come the chile, the sweet bell pepper and the spices paprika and cayenne. It was on his fourth voyage in 1502 that Columbus discovered, in what is now Nicaragua, the cocoa bean, which was duly brought back to Spain. It aroused little interest at the time. It wasn’t until 1519 that Hernando Cortez tasted it, prepared as a drink by the Aztecs, flavored with vanilla—the fruit of a native orchid—and sweetened with cane sugar—which Columbus had carried to the New World and planted there in 1494. Spain and Portugal then enjoyed a century-long monopoly on chocolate, which became exceedingly popular. Columbus did not find tomatoes in the Caribbean lands he explored. They were probably brought from Peru or Mexico to Spain around 1520 and passed on to the kingdom of Naples, which came under Spanish rule about the same time. The Italians and Spaniards were early pioneers in the use of the tomato in cooking, while other Europeans shunned it for another 200 years. Columbus did not taste that native American bird, the turkey. A chronicler of Córtez, around 1519, reported seeing turkeys in Mexican markets and said they were cooked daily for the Aztec ruler Moctezuma’s table. All of these foods incredibly enriched the Spanish diet, which by the sixteenth century was probably the most varied in Europe. During the sixteenth century Spanish galleons plied two great oceans so that eventually they opened up trade routes to the real Spice Islands. Explorers also carried crops and livestock from Spain to the New World. Many of these came to Spain from farther east, introduced by the Romans and the Arabs. At the top: chickens, pigs and cattle. 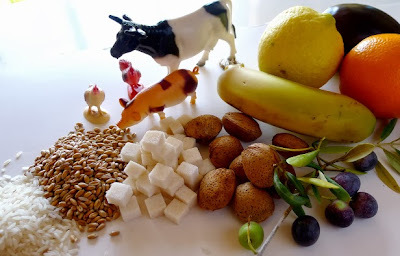 From the left: rice, wheat, sugar, almonds, bananas, citrus fruit, eggplant, and, in the front, olives. Not all exchanges were positive. Sugar and cotton plantations in the New World led to slavery. Diseases such as smallpox unleashed in the New World decimated indigenous peoples. To celebrate Columbus Day or Spain’s Fiesta Nacional, I am cooking a dish that nicely illustrates the migration of foods. Alboronía is originally a Moorish dish, meat stewed with eggplant and other pre-1492 vegetables, that the Arabs introduced into Spain. But, as it is prepared today, it contains all New World vegetables—squash--both pumpkin and zucchini, potatoes, tomatoes, peppers. Only the chickpeas, an Old World legume, and the seasoning of ground cumin are reminiscent of the pre-Columbian dish. 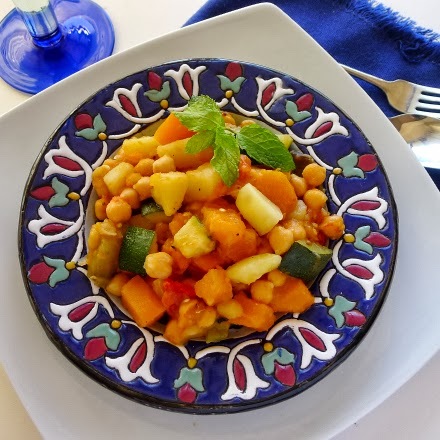 Alboronía--a Moorish stew with New World vegetables. 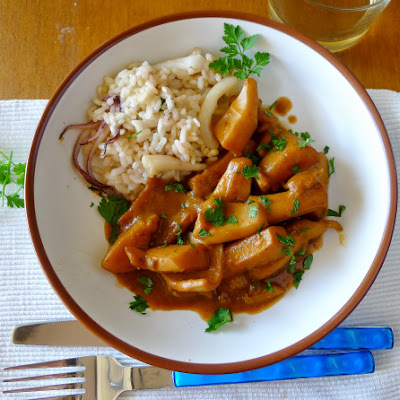 Use pumpkin or any other winter squash, such as butternut, in this recipe. I have used rather more spices than the current Spanish recipe calls for, making it more like the spicing from the 15th century. Canned chopped tomatoes can be used in place of fresh ones. Put the pumpkin, potatoes, eggplant, bay leaf and salt in a cazuela or pan. Add the water. Bring to a boil, cover, then simmer gently until potatoes are almost tender, 12 minutes. 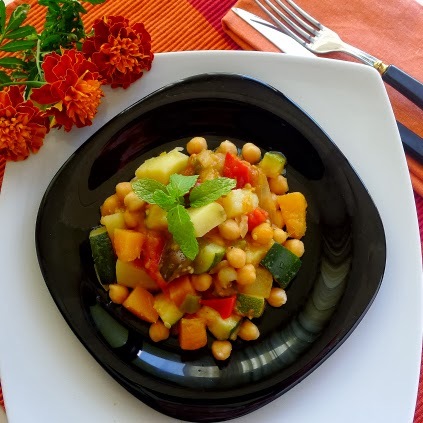 Add the chickpeas and zucchini. Cover and cook another 10 minutes. Remove from the heat. In a skillet, heat the oil and sauté the onions, peppers and chopped garlic for 3 minutes. Add the tomatoes and cook on medium-high heat until tomatoes are somewhat reduced, 6 minutes. 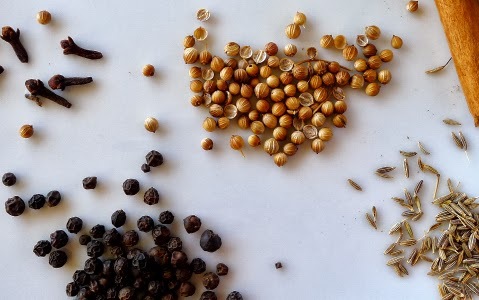 In a mortar, crush the cumin, coriander, peppercorns, clove and cinnamon with the coarse salt. Add the remaining two cloves of garlic and pound to a paste. Add the garlic-spice mixture to the tomato sofrito in the skillet. Add the vinegar. 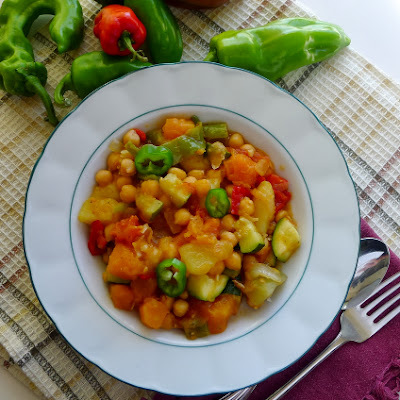 Stir the mixture from the skillet into the pumpkin-chickpea stew. Cook another 10 minutes. Serve hot garnished with chopped mint. Cuttlefish dish created by Chef Enrique Sánchez at Andalucía Sabor. I’m looking through the notes and photos I took at ANDALUCÍA SABOR, food forum and trade fair in Sevilla dedicated to the foods of southern Spain. The theme of the conference this year was LA TAPA. TRADICIÓN E INNOVACIÓN EN LA COCINA ANDALUZA (The Tapa. Tradition and Innovation in Andalusian Cuisine). Right up my camino! Fernando Huidobro, Dani García and Angel León. What a line-up! 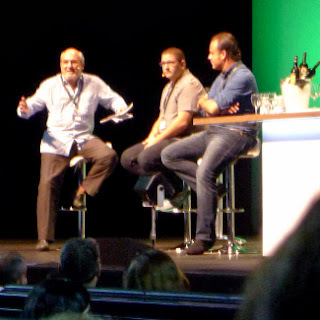 Featured were some of Andalusia’s top chefs—Dani García (two Michelin stars for La Calima in Marbella), Angel León (one star, Aponiente in El Puerto de Santa María), José Carlos García (one star for eponymous restaurant in Málaga), Julio Fernandez (one star, Abantal, Sevilla), Diego del Río (one star, El Lago, Marbella), José Alvarez (one star, La Costa, El Ejido) and more. 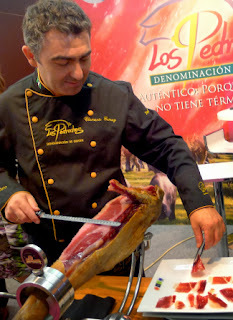 Clemente Gómez, master ham slicer. I watched two days of cooking demos showing off taste-boggling combinations, high-tech techniques (gels, airs, foams, smoke), witty juxtapositions, artsy plating and, generally, lots of ¡wow! factor. Some of the most interesting presentations were riffs on ingredients. For example, Paco Roncero (two stars, La Terraza del Casino, Madrid) used a single varietal olive oil, Picual, in three styles, early harvest (October), mid harvest (November) and late (December) in creating three different dishes, each showcasing the flavors of the oils. Oh, there were some far-out techniques involved too—freezing the oil, turning it into butter, then dipping it in malitol to make a caramel, turning it into popcorn. Or something like that. Admittedly, the Andalucía Sabor conference was intended for professionals. Nevertheless, the show cooking I liked best were those that actually could be accomplished by a home cook. 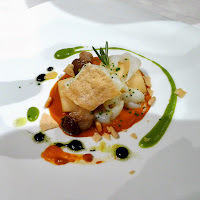 One of these was presented by Enrique Sánchez, a TV chef (Cómetelo, Canal Sur TV), who deconstructed a very traditional recipe from Cádiz, Chocos al Pan Frito, cuttlefish with fried bread. The traditional recipe is made with a red pepper sauce thickened with fried bread with onions, garlic and parsley. Enrique made a light red pepper sauce with parsley oil to decorate the dish. Instead of chopped onions, a delicate hint of chives finished the dish. Beads of black alioli, made from cuttlefish ink, lent drama to the plate. 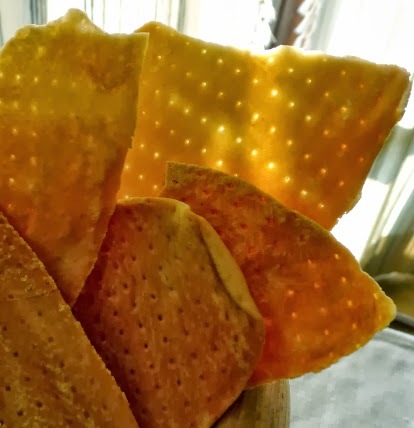 Instead of fried bread, shards of regañás, a crisp cracker, garnished the dish. I’m honestly not sure where the rice was incorporated or why some toasted pine nuts finished it off, but it looked scrumptious. And, didn’t require any special equipment or ingredients to produce. But, in the booklet published for congreso attendees, appeared, not the deconstructed recipe, but the traditional one. So, here’s my take on the traditional recipe. Traditional: Tender cuttlefish in a sauce thickened with fried bread. 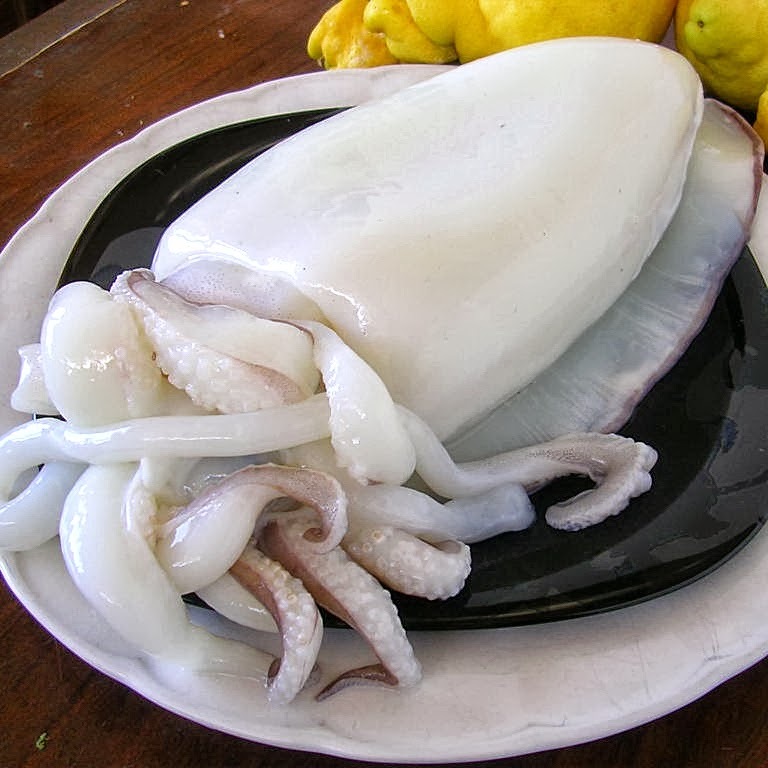 Cuttlefish, cleaned and ready to cook. Cuttlefish (sepia, jibia, choco) is a cephalopod (like squid and octopus), with the “shell,” or cartilage on the inside. The cuttlefish body is much rounder and thicker than the squid (calamar). Not as tender as squid, cuttlefish is usually braised or stewed in a sauce. Squid can be substituted in this recipe, but will need less cooking time. Ñoras are plum-sized dried red peppers with a bitter-sweet flavor. If not available, use an additional 1 tablespoon pimentón (paprika) in this recipe. Remove stems and seeds from the ñoras and put them in a bowl. Cover with hot water and allow to soak for 45 minutes. Heat 2 tablespoons of the oil in a pan or cazuela. Fry the bread until browned on both sides. Remove it to a dish. Pour the manzanilla over. Add 1 tablespoon more oil to the pan. Sauté the onions and garlic on medium heat until softened, but not browned, 5 minutes. In a blender or food processor, puree the soaked ñoras, fried bread, onions and garlic from the pan and parsley with ½ cup of the ñora soaking water. Add 1 tablespoon more oil to the pan and sauté the pieces of cuttlefish. Sprinkle with the pimentón. Add the bread paste to the pan with enough water to cover the cuttlefish, about 2 cups. Simmer, covered, for 1 hour, stirring occasionally. Uncover and cook until cuttlefish is very tender, about 15 minutes longer. 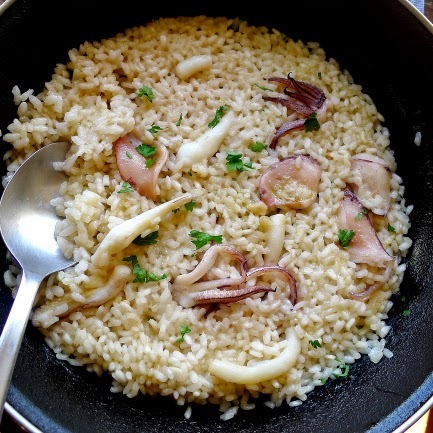 Serve the cuttlefish accompanied by the rice and sprinkled with chopped parsley. Rice with cuttlefish tentacles, a side dish. Heat the oil in a small skillet. Sauté the tentacles of cuttlefish. Add the sliced garlic, then the rice. Add water or stock and salt. Bring to a boil, then lower heat and cook, uncovered, until rice is tender, about 16 minutes. Allow to set 5 minutes before serving as an accompaniment to the cuttlefish. Regañás--a shatteringly crisp flatbread, used instead of fried bread in the interpretation of the traditional cuttlefish dish.